A month or so back I mentioned in one of my posts about wanting to tear up the carpet on my stairs. Well I did and project Replace Carpet with Stair Runner is done! Are you ready for some before and afters?? The Before– A boring beige carpet that was a magnet for dirt and cat hair. I’m super happy with how it turned out and the lightness and brightness it brings to the entryway. 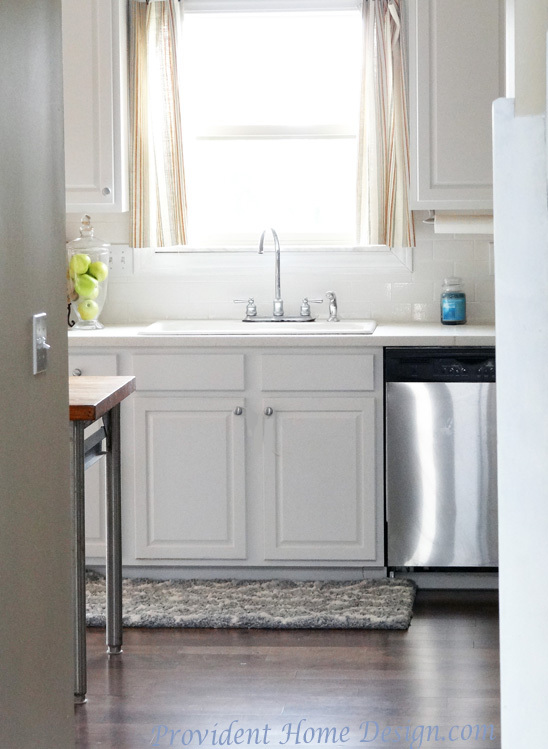 As you may have noticed in the photo above our kitchen gets a lot of light and our front entry is 2-story with a window so it gets light but the hallway going to our kitchen is always dim. I always feel like when I invite guests over I have to take them through a dark tunnel (my hallway) and I feel the need to encourage them to “go towards the light, go towards the light”. A project I plan to do in the future to hopefully lighten up the hallway is to paint it all white and add decorative molding! I’m excited! So excited that I created a terrible photoshopped picture of it all white and boxed up in molding. Okay, sorry, back to the stairs! 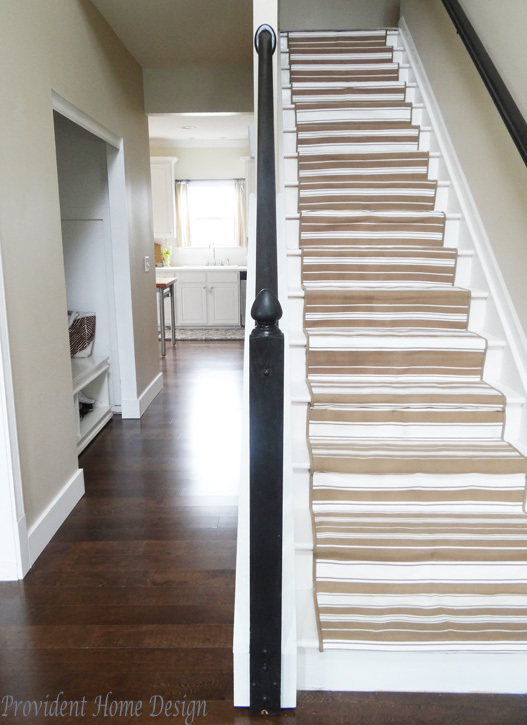 Do you wonder how much this DIY stair runner cost? 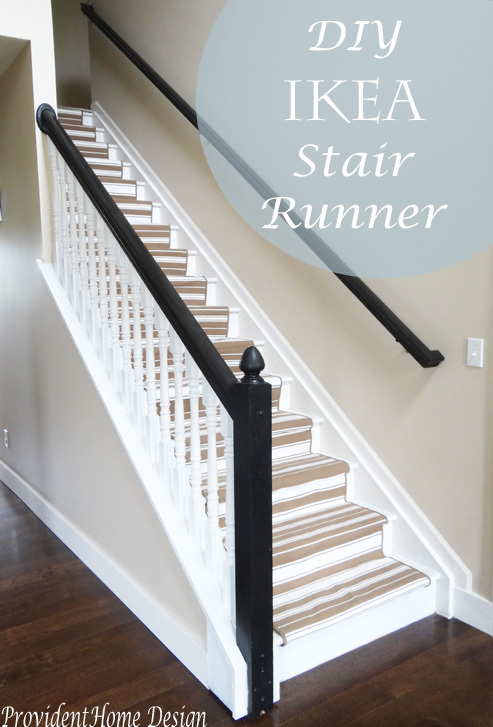 Most stairs runners cost over $200 even DIY-ed. This cost me about $65. A few months ago when I went to IKEA (a 4 hour round trip) to buy some items for the boys’ room makeover I also went to check out a rug runner I thought could work as a stair runner. Above is the one, the Alslev Rug. It comes in 2 sizes a 2 ‘ 7 “x 4 ‘ 11” for $16.99 and a 2 ‘ 7 “x 6 ‘ 7 ” for $19.99. The weekend I went I lucked because there was a deal going on where you could purchase the Alslev Rug smaller size for $9.99 and longer size for $12.99 if you were an IKEA Family card member. 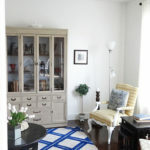 I signed up to be a IKEA Family card member to get the deal! I came home with 3 smaller sizes and 2 longer size. In retrospect I wish I would have just bought all of the longer sizes even if it did cost a little bit more. 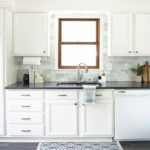 One reason is because it looks better and installs quicker using the longer rugs and second reason because although the description says the two sizes are the same width (2’ 7”) the longer rug was actually about an inch to an 1 /1/2 less wide. 1. 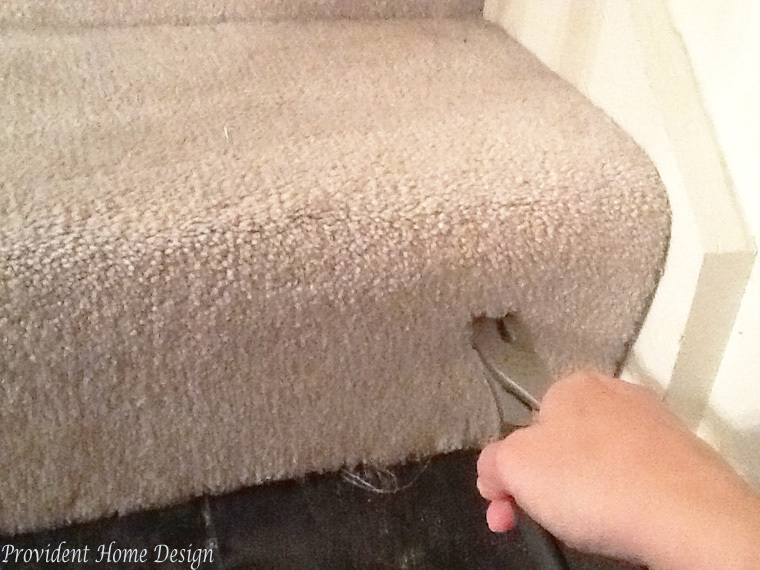 I started with the bottom step by using pliers to pull carpet away from stairs. 2. Once you get the carpet up this is what you will see. The blue stuff is the carpet padding and the arrows show where the nail strips are. With a flat head screw driver up against the nail strip strike the end of the screw driver with a hammer until you can get under the nail strip and pull it up (you may want to use gloves during this step). TIP: Getting the nail strips up is the longest part of the process. I only had a little bit of time each night to work on this project so I did a few steps at a time and then put the carpet back down over the steps. 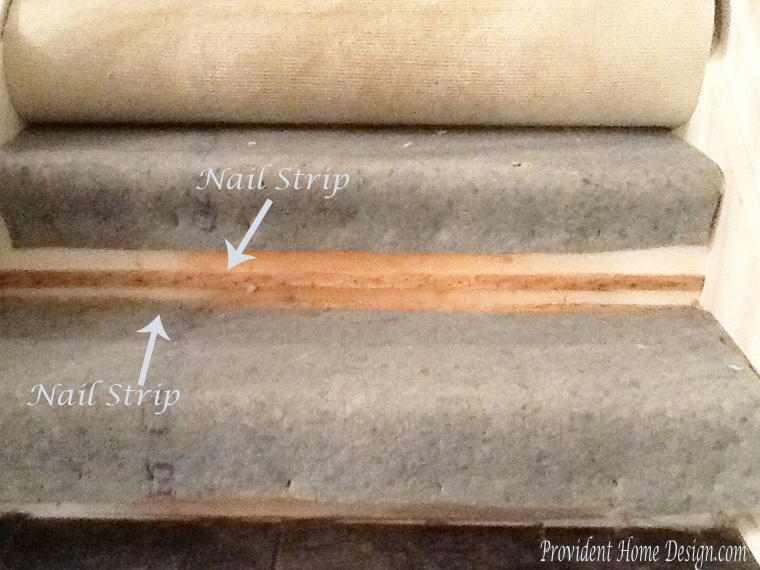 I wouldn’t pull the whole carpet off the stairs all at the beginning unless you knew you were going to have the time to get all the nail strips up in one big block of time. 3. Once the strips were up I cut away the edges of my carpet padding. I knew I wanted to keep the carpet padding for the stair runner because then I would have to buy new ones plus it was conveniently there. So with scissors I just trimmed away the padding on the sides (as shown in the first couple of steps) and then removed the staples that had been used to keep the padding down on the sides. To get up the staples just use your flathead screw driver to get up under the staple and pop it up. 4. There will be some holes and imperfections left from the staples and nail strips so the next step is to patch up the imperfections. 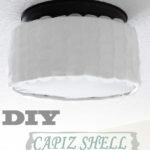 I used spackle and a putty knife to fill in holes and to scrape excess spackle away. 5. Once the spackle is dry lightly sand and wipe away dust and debris. 6. Now you are ready to paint! I gave the sides of the stairs(where the runner wouldn’t cover) a fresh coat white paint. 7. 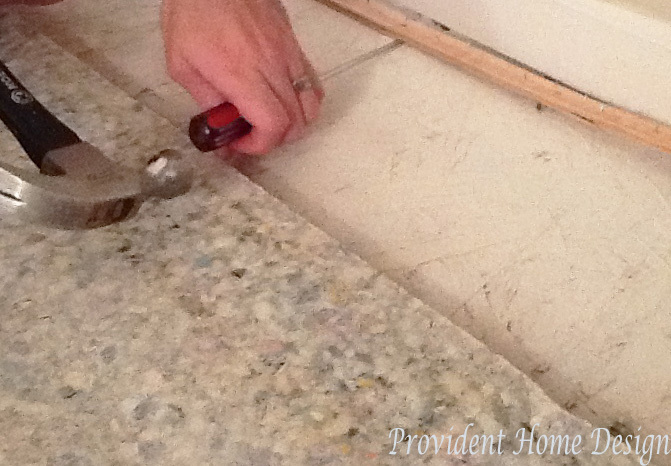 Next I followed the tutorial over at Young House Love for installing the runners. You can find it HERE. I will let you know how the new stair runner holds up! I’m really hoping that the scotch guard can keep it fresh and clean! I figure if it gets dingy after a few years it didn’t cost too much so I could rationalize taking it off and staining the steps to match the new hardwoods and to do the beautiful brown and white look! Has anyone else tackled their stairs and have additional advice to share? Love this! I have frequently thought about doing this to my stairs. I was even thinking about it when we recarpeted the upstairs, including the stairs. It wasn’t too much after later that I regretted it and wished I’d done this…. Of course, it’s currently pretty far down on my to-do list, but maybe someday! It looks great! I love the stripes! We have the same boring beige carpet and this has been on my to-do list for 5 years now! Tamara, this looks great! It really brightens up your stairwell. You are one busy, talented lady! So sweet of you, Tracy!! :-) Thanks for stopping by today! I love it! What a great look. 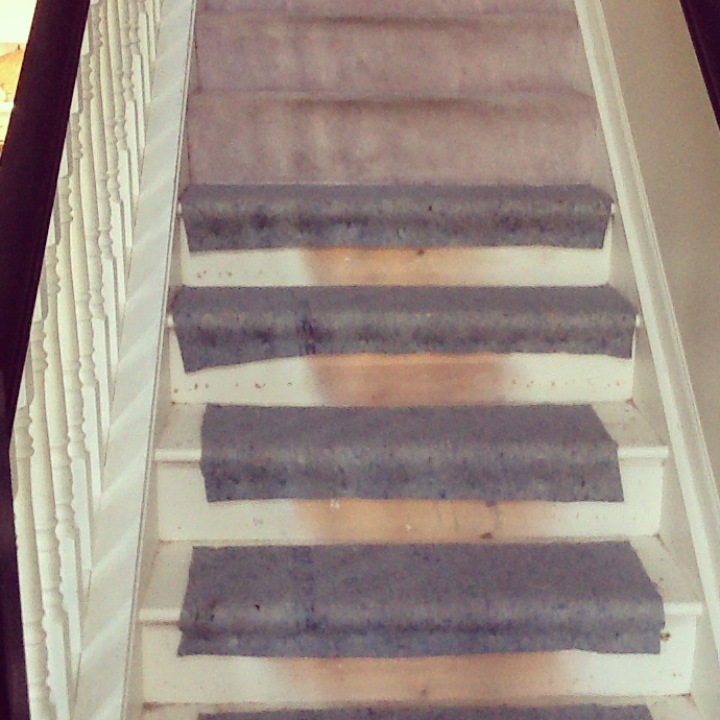 Our stairs carpet looks terrible and I have been dreading replacing it. I may just have to give this a try. Thanks for sharing. You are welcome, Julie! It’s not the most fun DIY but so worth it! What a great idea! It looks great! Visiting from the Work It Wednesday link party. 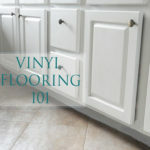 Are your floors upstairs carpeted or hardwood? I’d actually like to see how the top of the stairs look going into the hallway. Picture, please!! My floors upstairs are carpet. I will send a couple of pics to your email, Zohra! I would lIke to see how runner transitions upstairs too! Sure! I will email you a photo today, Shauna. 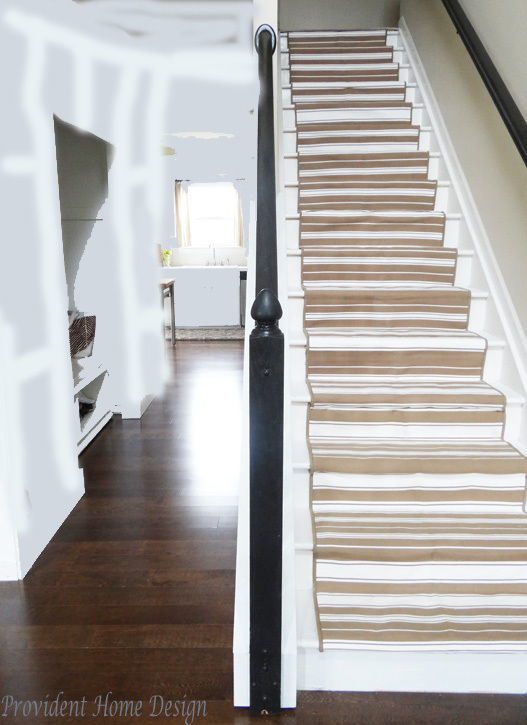 I am thinking about doing this project as white stair carpet is so hard to keep clean on the stairs. I would like to see the runner transitions upstairs. I have carpet up stairs as well. Hi Darcy! :-) I just sent you two emails with attached pictures. Let me know if for some reason you don’t get them. I would love to see the pictures!!!! Hi, I tried sending the pics to the school email you left but the delivery failed. Do you have a different email address I could send them too? If so you can email it to me at Providenthomedesign@gmail.com. Thanks! I would love to see a transition from the stairwell. Also how is this holding up? Hi Shawna, I tried to email you the photo at the email address you left in the comment section but it came back as an error. Do you have a different email address I could send it to? 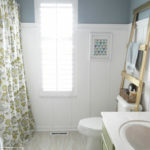 Tamara, thank you so much for sharing your great DIY ideas. 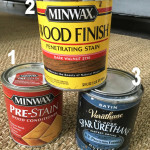 I found your site while deciding whether to paint my kitchen cabinets with the rustoleum cabinet transformations kit. I’m half way through painting them white. 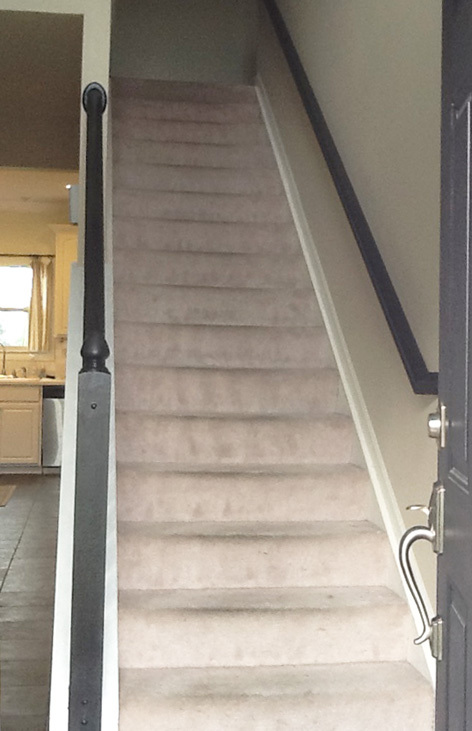 I love your carpet runner project and was wondering why you chose to paint the stairs white rather than stain them. I don’t know what I’ll find under the builder grade carpet on my stairs, but hope I can stain them. If not, the white stairs look great, too. I’d love to hear your thoughts. Thank you. Hi Michelle! 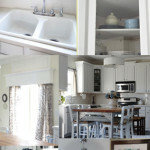 How exciting that you are painting your cabinets white!! :-) I chose to paint the stairs white for a couple of reasons. First I love light and airy spaces so all white would help achieve this look. Also I haven’t had great experiences with getting stain to be the color it says it will be so I felt painting it white would be a lot easier. Lastly, I’ve heard (and it seems to be true) that stairs are made with pretty cheap pine wood that doesn’t stain very well (evenly). 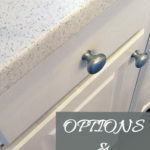 If you like the stained look better it’s worth a try, you could always paint over it if it didn’t work out! HI! I am also interested in seeing how this looks with the carpet on the top of the stairs :). What a great idea. 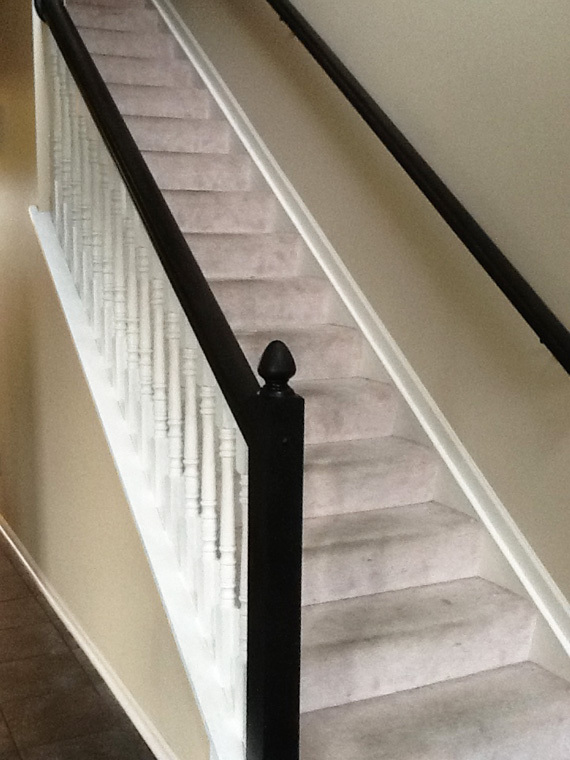 We have been trying to think of an economical way to cover the stairs that looks nice and your project is very inspiring. Thanks for the idea! I would like to see how the runner transitions to the carpet upstairs. Have a similar project. Thanks.